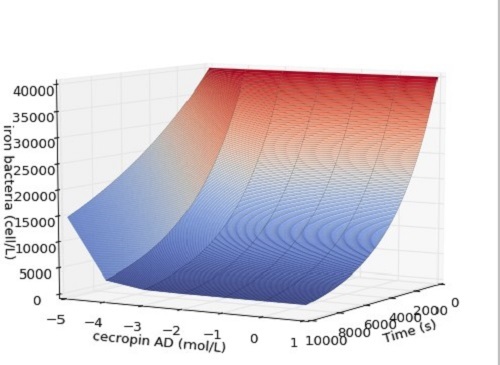 In order to measure the ability of engineered bacteria to kill iron bacteria, we modeled the production of the cecropin AD and the sterilizing ability of the cecropin. 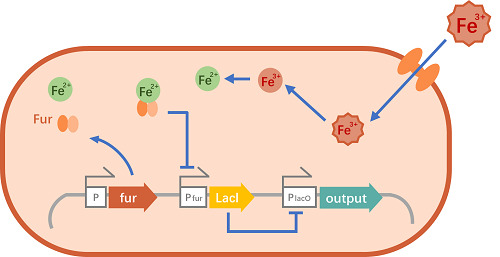 We want to model the fur-box fell the concentrate of Fe2+ to drive the LacI to reverse the signal to produce the cecropin AD which play a bactericidal effect. So our model used in the project includes four parts: the iron sensor, the inverter system, the sterilizing system and the chelator system. The first part focuses on the sensor system to find the Fe2+ needed by our system. And the strength of the best promoter with the fur-box of the three kinds of fur-box was determined. Second, the inverter system our team implemented in the bacteria focused on the cecropin AD produced with time. The third part modeled the sterilization rate of the cecropin AD. The last part integrate those previous parts leading to the cecropin production and sterilization. The model show the time it takes for our bacteria system to work. We first modeled the sensing system using ODEs with the help of experimental results to determine one of our parameters ki1.We had three kinds of fur-box designs. 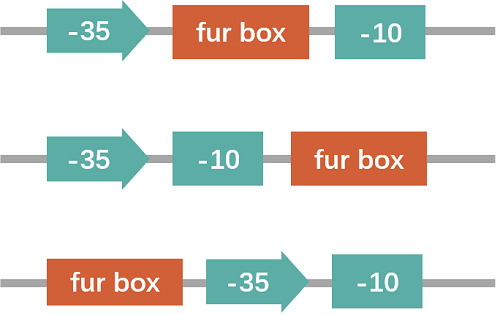 We model our three kinds of fur-box (shown in the figure 2) to find the optimal fur-box and the strength of the promoter with the best kind of fur-box. We finally corrected our model through the experiments. We make this framework like figure 1. We just want to use differential equations more easily. And we can easily divide our [FeFur] by two to get the real complex concentration. 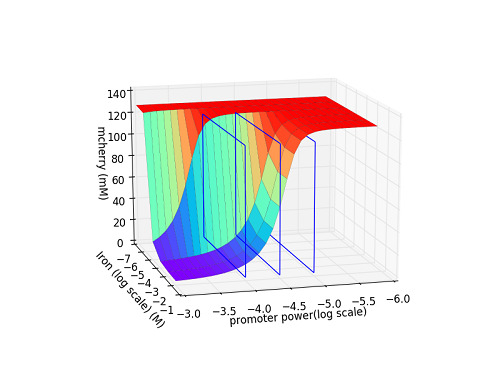 We model the iron input in the bacteria using a linear function of the external iron concentration Ferext with the factor p which is the cell-wall permeability for iron. 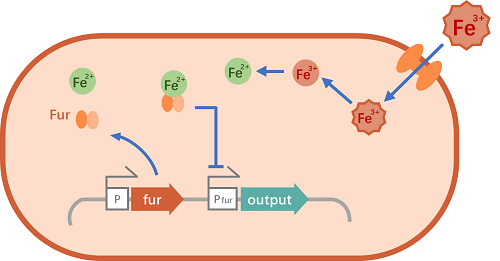 We track the free Fe-FUR complex but not those attached to a Fur Binding Sites in our model. Ki1 is a non-dimensional parameter which repesents the inhibition power, and Kf is the fixation rate of the Fe-FUR on the FBS. 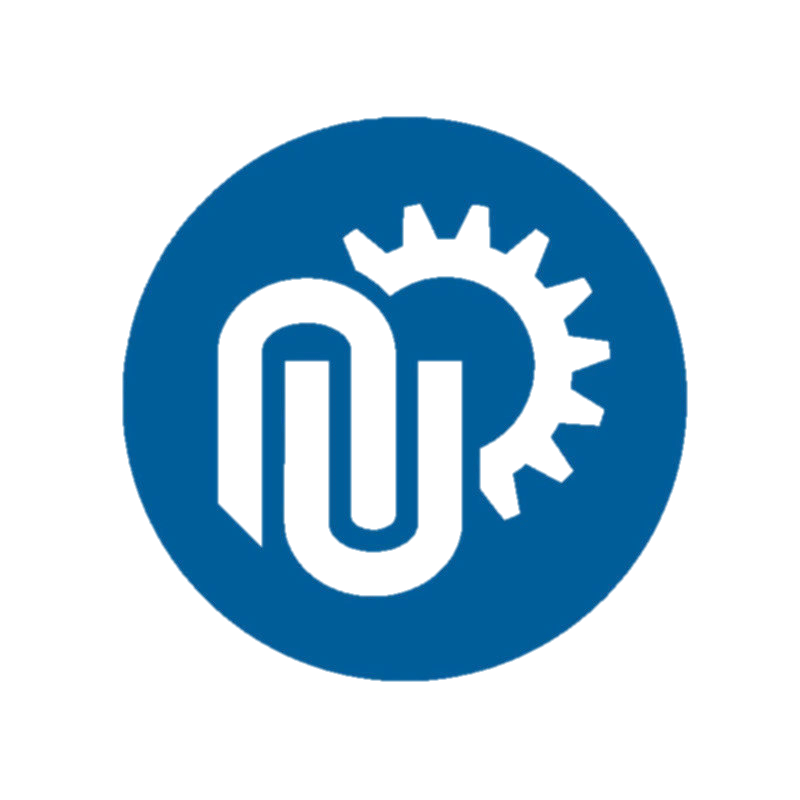 Npla1 is the number of pasmids containing the sensor system. We want to know the fittest ki1 for the model to sense the iron and the concentrate of iron. We make three kinds of fur-box for our sensor system. We want to know which is our best choice. Our experiment result show in the figure 3. Then we try to change the value of Ki1 to model different strength of promoter with fur-box in our experiment which show in the figure 4. We want our system to make sense in the high level of Fe2+, so we choose the fur-2 system. And we finally set the KI1:7.4*10-4. We make the system framework shown in the figure 5. We built the inverter system using lacI-lacO on the basis of sensor model to determine the concentrate of cecropin AD and the need of time. The [mRNA] and [LacI] equations are alike. The prodction rates are Kr for the mRNA and KL for the LacI. Since FBS represents the number of inhibited Fur Binding Sites, we have to substract it from Npla1. Ki2 is the inhibition power and Npla2 is the number of plasmimds containing the mcherry. FBS and Mcherryexpressed are both ruled by a normal logistic function. If we were to track the number of expressed LacI or Mcherry, we would be using two inverted logistic fuctions to model a double inverter. Since FBS represents the number of repressed genes and Mcherryexpressed the number of expressed genes, the double inverter is still there. 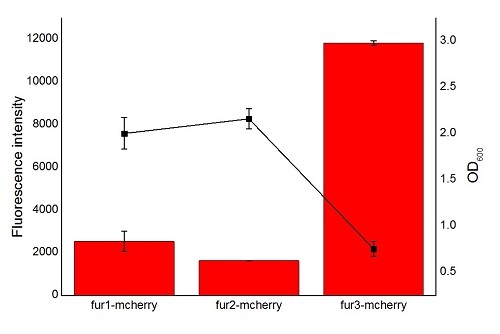 Finally we equate the concentration of Mcherry to the concentration of cecropin AD. 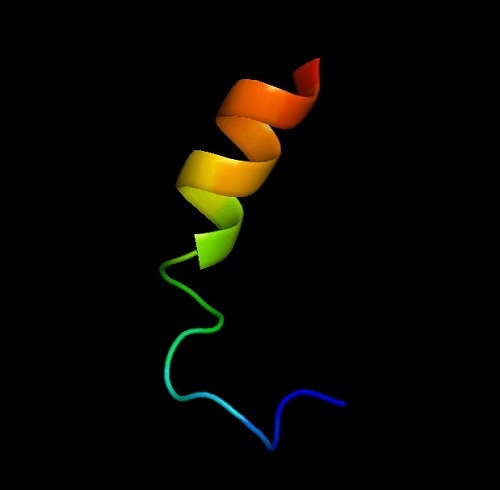 In order to answer the question, we make the genes in the Pet-28a plasmid. So, we know the Npla1 and Npla2 parameters access to literatures which set it 400. We try to made our sensor and inverter system work in our bacteria.And we get the value of the Ki2 by the experiment of Mcherry expression. Finally, we set Ki2 at 25 to model our system. 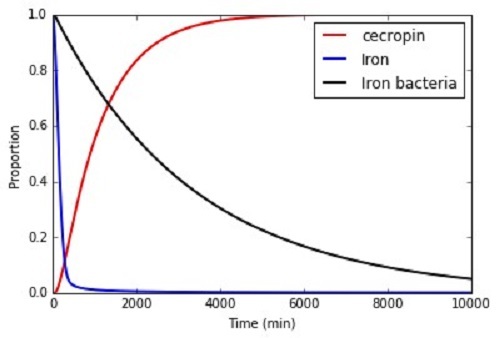 As shown in the figure 6, there is a significant result which tell us the bacteria produce cecropin AD at the concentration of iron with time. 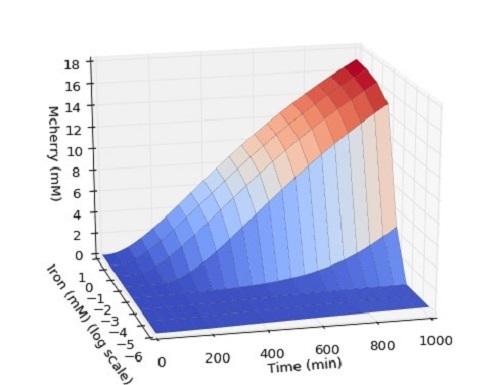 We model the sterilize system with the help of experiment: We tested the death time curves of iron bacteria with different concentrations of cecropin AD. This can help us analyze the amount of cecropin AD required. The cecropin AD which show in the figure 7 can lyse bacteria to kill iron bacteria. The cecropin AD has α helix. It can insert in to the bacteria. We need to know the titer of the cecropin AD produced by our bacteria. So we conducted a sterilization experiment. We conducted a standardized experiment to determine the MIC of cecropin AD. We set the MIC:4*10-5M. Then we have plotted the death curve of iron bacteria at different concentrations of the cecropin AD show in the figure 8. "How much time is needed for our bacteria to sterilize the iron bacteria from the moment they sense the iron?" This include the sensor and inverter system and sterilizing system leading to a double inverter and sterilize the iron bacteria. We plotted the time curve of iron bacteria concentration, iron concentration, and cecropin AD concentration. We focus on the time when the iron bacteria become little so we translate these concentrate to proportion. The result show in the figure 9. It can be seen from the figure 9 that the bacteria were completely killed after about 9000 minutes. 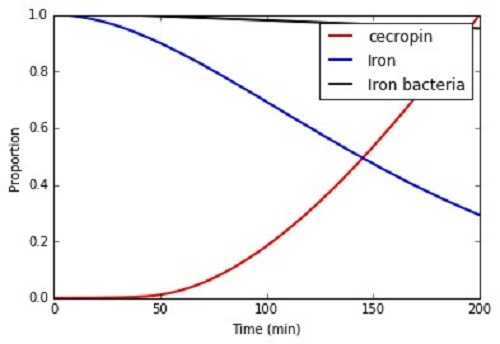 The time curve of iron bacteria proportion, iron proportion, and cecropin AD proportion. We want to know the accurate time which our system make sense. We focus on the initial concentration change time curve which show in the figure 10. It can be seen from the figure 10 that the cell death starts from about 75 minutes. the curve of time from 0 to 200 min. We finally can determine the time our system need from our model. Our system has a 75 minute delay start time. The total work completion time is 9000 minutes. This bacteria can remove rust within seven days. You can freely re-use our code:fur-sensor and inverter system model by python. 1. QIAGEN, Origins of replication and copy numbers of various plasmids and cosmids In: Growth Of Bacterial Cultures, 2013 - 2017. 2. 高朝贤, 郑浩渠, 惠长野,等. 红色荧光蛋白变种mCherry的表达、纯化和应用探讨[J]. 国际生物制品学杂志, 2017, 40(1):31-35. 3. 高朝贤, 郑浩渠, 惠长野,等. 红色荧光蛋白变种mCherry的表达、纯化和应用探讨[J]. 国际生物制品学杂志, 2017, 40(1):31-35. 4. 张惠展. 基因工程概论[M]. 华东理工大学出版社, 2001. 5. 朱玉贤, 李毅, 郑晓峰. 现代分子生物学[M]. 高等教育出版社, 2013. 6. 戚以政, 夏杰, 王炳武. 生物反应工程[M]. 化学工业出版社, 2009.